Thick and lush enough to cover pipes, vents and other eyesores, but not so tall as to be overpowering. Dark Green Spreader Yew grows 3–4' in height with a 4–6' spread. 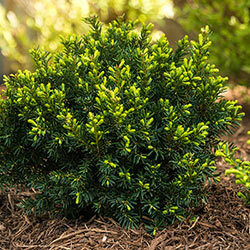 Its low-growing, spreading habit and dense, soft needles make this evergreen shrub a perfect foundation plant. Wonderful in rock gardens or in areas where you'd like to add contrast and texture to a winter landscape. You can plant it now because we are shipping this variety through the summer, at a more established size in a gallon pot. Pruning: Prune early in summer to shape.